Did God send the Tsunami? In December 2004 I, along with millions, sat in front of my TV set appalled by the devastation caused by the Indonesian Tsunami. The video coverage wasn’t that great but we all still got a good idea of what was taking place before our eyes. Again in March of this year, a Tsunami struck northern Japan. This time the video coverage was extensive and horrifyingly graphic, and the reality of it flooded into our living rooms. In January 2005 I preached a sermon titled ‘Did God send the Tsunami?’ but again questions have arisen in the minds of many Christians. Is God punishing Japan, or is this His way of warning them, or is God not directly responsible? How we answer questions like this depends largely on how we understand the nature and character of God. Actually, how we view God affects almost everything in life, from how we interpret the scriptures to how we respond to the man burrowing through our garbage bin. There are a number of facets to the issue of natural disasters and I intend to cover several of them in subsequent posts. For now though I want to answer the question about the Tsunami by posing another question. Would Jesus send a Tsunami to indiscriminately kill thousands, some of them His disciples? You see the scriptures declare that Jesus Christ is the full manifestation of the Godhead to humanity – ‘For God was pleased to have all his fullness dwell in him’ (Colossians 1:19-20). Therefore, it is a legitimate question to ask. The life, works and words of Jesus are carefully recorded in four different Gospels and so we have a good basis for answering the question. 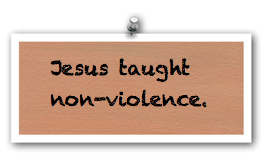 Jesus taught non-violence. When His disciples wanted to call down fire from heaven He rebuked them (Luke 9:54-55). He also rebuked the disciple who cut off the High Priest’s servant’s ear (Luke 22:51) and then immediately healed the ear. So, would Jesus kill thousands, let alone His own followers? No, I do not believe He would. In fact, quite the opposite, for Jesus spent three and a half years walking the length and breadth of Israel healing all who asked. So if Jesus would not have sent the Tsunami then how should we understand it? 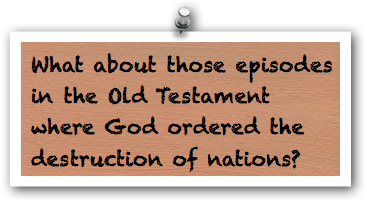 What about those episodes in the Old Testament where God ordered the destruction of nations? What about the great flood? And what about the Calvinist theology currently so popular that claims that God has predetermined all things? I will try to respond to these questions in my next few posts. However, I must say right up front that no matter what our belief is concerning these things, God is good and His grace and mercy are unlimited. Whatever happens in this world we can count on Him to be with us for He has said to us, as He said to Joshua “Be strong and courageous. Do not be afraid or terrified because of them, for the Lord your God goes with you; he will never leave you nor forsake you.” (Deuteronomy 31:6; Hebrews 13:5). Chris, I agree with your final comments that God is good and will be with us. I would like you to expand on what it means when the world appears to be falling apart to have God with us. It would appear that it does not (at least in all cases) mean that His disciples will be saved from disasters. Looking at the congregations where I frequent, I see little evidence of fealessness; on teh contrary, i see a lot of suppressed stress. So, irrespective of what I believe, how would it change one’s life to know that God is with us. Hi Keith, I agree that God does not promise to remove us from tough situations yet He does promise to be with us (Mtt 28:20 Psm 23:4 etc.) in all situations. His presence with us means (i) wisdom and direction, (ii) comfort, (iii) The ability to make sense of what is happening because of His undertaking to use the circumstance to bring about good in some form. In the final analysis God’s presence in our circumstances means that irrespective of what happens we have the potential of growing to be more like Jesus through the actual experience itself. With God all things are potentially redemptive and developmental but without Him they are not redemptive and seldom developmental.